The first WhiteKnightTwo/SpaceShipTwo launch system has undergone extensive tests. Next to come are critical rocket-powered flights of the two-pilot, six-passenger spaceship. A new initiative could be on the horizon for suborbital spaceship company Virgin Galactic, founded by British billionaire Sir Richard Branson. Branson is expected to announce Virgin Galactic Cargo, a renewed effort to launch small satellites commercially, and reveal design changes to his tourism spacecraft SpaceShipTwo (SS2) at the U.K.'s Farnborough International Airshow next month. Virgin Galactic Cargo could see an unmanned rocket, air launched by SS2's carrier aircraft WhiteKnightTwo (WK2), carry satellites weighing up to 440 pounds (200 kilograms) into low-Earth orbit for a price tag of $1 million to $2 million. This was Virgin Galactic's plan when it announced in July 2009 a small satellite launcher project along with a $280 million investment in the spaceline by Abu Dhabi investment company Aabar. Aabar agreed to invest $110 million in the small satellite launcher project if it was found to be feasible. However, in October 2010, the project, then named LauncherOne, went into a hiatus after Virgin Galactic's one U.K.-based staffer working on it full-time left. On June 21, Virgin informed media that it would have a press conference with Branson at 11 a.m. at the Farnborough air show on Wednesday, July 11. About 200 of Virgin Galactic's approximately 500 customers are to attend. In answers to Royal Aeronautical Society audience members, Attenborough denied that Virgin Galactic Cargo would provide WK2 for third parties to launch their own rockets from. Asked by SPACE.com afterward if a Farnborough announcement could be expected, he added, "We've always had other applications in mind. We started to look at small satellite launchers a couple of years ago, we continued to do quite a lot of work on it and it is still an area we're very interested in it and at some stage we're making some announcements. I can't say more than that." LauncherOne was a largely British affair, with discussions involving the U.K. company Surrey Satellite Technology and the U.K. Space Agency. The "quite a lot of work" Attenborough refers to will likely be the U.S. Department of Defense's Defense Advanced Research Projects Agency (DARPA) program Airborne Launch Assist Space Access (ALASA). The program was announced in November 2011 and Attenborough told SPACE.com that Virgin Galactic has been awarded an 18-month ALASA contract. DARPA is interested in airborne launch systems that could put a 100-pound satellite into orbit for less than $1 million. Virgin Galactic's ALASA work may include the spaceline's propulsion consultant Whittinghill Aerospace. Its owner, George Whittinghill, was awarded $600,000 by NASA in 2010 to start development of a launcher capable of putting a satellite weighing more than 50 pounds into low-Earth orbit. Attenborough said Virgin Galactic was not collaborating on the NASA-funded launcher. Whittinghill was not available to comment on his satellite launcher. The apparent 22-month hiatus was likely because Virgin Galactic saw a better future for a United States-based small satellite launcher project than a U.K. one. There are no plans to launch satellites using SS2, but a full-size mockup of the space tourism vehicle is expected to be unveiled by Branson at the July 11 press conference at the air show. The air show organizers, Farnborough International, confirmed to SPACE.com that a full-size mockup of SS2 would be there. The SpaceShipTwo mockup may include changes to the vehicle following its Sept. 29, 2011, glide flight that saw the spacecraft stall, which is where aircraft lose aerodynamic lift. For that flight, Virgin Galactic's prime contractor, Mojave-based Scaled Composites, reported on its website that "Test card called for releasing the Spaceship from WhiteKnightTwo and immediately entering a rapid descent. Upon release, the Spaceship experienced a downward pitch rate that caused a stall of the tails." SpaceShipTwo has not made a glide flight since. The SS2 changes were revealed in a blog by the Planetary Society's science and technology coordinator Emily Lakdawalla. She described the changes as "a very wide pair of strakes — horizontal triangle-shaped fins — to the twin tails of SpaceShipTwo, on the sides of the tails facing in. These are actually the third set of strakes added to SpaceShipTwo to improve its stability. They had a definitely different appearance from the polished surface of the rest of SpaceShipTwo — clearly a late addition, and one that's not included on the concept art." Scaled officials were not available to comment on these additions. Attenborough said he didn't know any details about these changes or whether they were motivated by the troubled September test flight. "One such addition that has been seen in action and publicly confirmed is a belly flap that slows SS2 down much faster when it lands. Virgin Galactic is now predicting the first rocket powered supersonic SS2 flights by the end of the year. 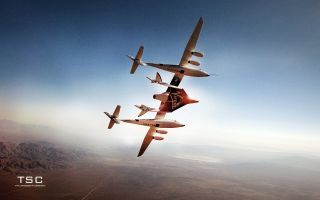 While Scaled does not preannounce test flights and their pilots, Branson may announce at Farnborough that his spaceline's chief pilot David Mackay, a former Royal Air Force test pilot and Virgin Atlantic captain, will pilot SS2 for the first time during the spaceship's 18th glide flight. Scaled's WK2's June 15 flight report said Mackay was the mothership's pilot and that the goal of the flight was "Virgin Galactic WK2 pilot proficiency and joint SS2 GF18 pilot proficiency." The code GF18 means glide flight 18. SpaceShipTwo's last glide flight on Sept. 29, 2011, was its sixteenth.